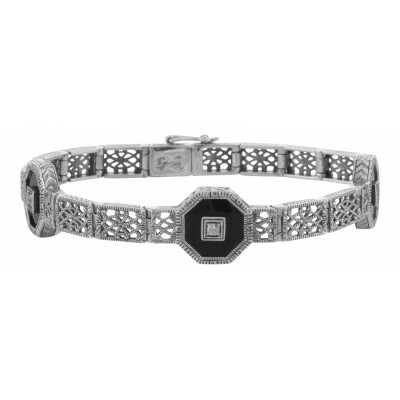 Black Onyx and White Topaz Art Deco Silver Filigree Bracelet. 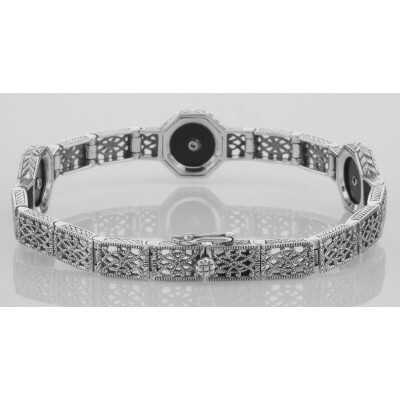 This is a lovely Art Deco Style Black Onyx filigree link bracelet it is handcrafted and finished in intricate sterling silver detail. This silver bracelet features three polygon shaped Onyx Stones with a prong mounted small White Topaz gemstone in the center. 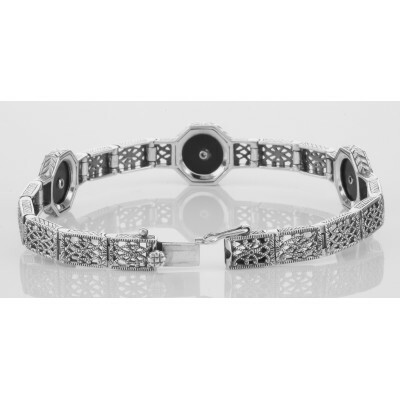 Onyx filigree bracelets are timeless in style and can be enjoyed, cherished and handed down as precious family heirlooms. This antique style onyx filigree bracelet can be a perfect gift for many occasions, or just because. This bracelet is new and a quality sterling silver antique reproduction and comes with a money back guarantee. Please see our nice selection of fine Antique / Art Deco Victorian style filigree jewelry.